EXPECT to see some starry pictures of Bollywood pin-up Priyanka Chopra invading your digital space over the next 24 hours or so. But not a film she has starred in – one she has produced and which will today be unveiled to the world at the Toronto International Film Festival (TIFF, September 7-17). ‘Pahuna: The Little Visitors’ is a film made in Sikkim, which is a tiny Indian state wedged between Nepal and Bhutan in the north east of the country and is on one edge of the Himalayan range. Chopra’s production company Purple Pebble Pictures specialises in regional Indian cinema and is much less at the commercial edge of anything Chopra herself does in front of the camera. Her mother, medical doctor – Dr Madhu Chopra, is a co-producer and Priyanka’s brother, Siddharth is also involved in the company. Mother and son were in Cannes earlier this year talking about the films they wanted to back – in Indian regional languages, with a healthy female perspective and more fine-tuned to art than profit as a primary consideration. A beneficiary of all this has been – Paakhi Tyrewala (pictured), who has written and directed ‘Pahuna’. A former model and Bollywood actor, she is now focusing on directing and writing – ‘Pahuna: The Little Visitors’ is her first feature. She told www.asianculturevutlure.com Priyanka’s backing of the film helped to get her over the line when it came to making it. For this film she also got financial assistance from the Sikkim state government and the Children’s Film Society of India. Tyrewala speaking from Mumbai last week before leaving for today’s Toronto premiere, told www.asianculturevulture.com: “I’d really fallen in love with Sikkim, it’s slightly alienated from the rest of India. She had visited as a Sri Sri Ravi Shankar Art of Living teacher some years ago – Sri Sri is one of India’s best known spiritual figures and his Art of Living courses are popular the world over. Tyrewala has centred the film around a brother and sister who face myriad challenges but overcome them (as only children can and do, she hinted). Chopra warmed to the script in November last year and Tyrewala began shooting in February in Sikkim. The film is made in Nepali, which is the prevailing language of the region and Tyrewala was determined to involve local people. “We made the film with local actors and each department had interns. As well as making films in a regional language, and giving women a chance behind the camera, as much as in front of it, Purple Pebble also likes films which are inclusive of children. “It’s really told from their perspective; she likes films about children, not necessarily for them,” revealed Tyrewala. 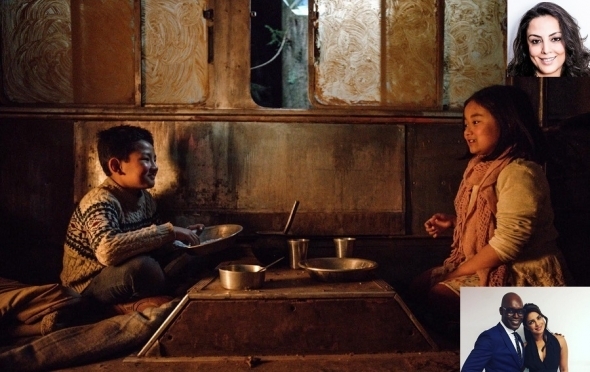 She developed a (visual) language with the child actors as Tyrewala doesn’t speak Nepali and it is quite different to Hindi. She told acv a young local helped her a lot with the dialogue and because of him it wasn’t problematic. “That was not the most difficult part, the weather was difficult, the terrain was difficult, the lack of oxygen was difficult,” Tyrewala revealed. She said some people even had to be hospitalised (because of the lack of oxygen at altitude), but quickly returned to set once they were healthy enough to do so. It was a particular labour of love for everyone. “The locals are so proud and supportive. “She (Priyanka) called me the other day and said; ‘When I see your film, it doesn’t look like you are a first time director. That was so satisfying, it almost made me cry a little. It’s a very good-looking film,” Tyerwala said heaping praise on her director of photography, Ragul Dharuman. “It’s a tiny film with a big heart,” she added. She also recently appeared in a video link-up with the IndPakUKnarrative London-based conference discussing her women-orientated short film, ‘Kajal’ . Tyrewala grew up in Delhi, and has always written, first plays, and then films, and acted as a way of getting into the industry and met her husband Abbas, a filmmaker in the process. She could not attend film school as she is dyslexic but comes from a family, where her mum was involved in amateur theatre, her father is a journalist and writer and her brother attended the highly regarded Indian Institute of Film and Television in Pune. It, however, sounded as though Tyrewala was not really prepared for the hullabaloo Chopra creates wherever she goes. Also showing at the festival is ‘Azmaish: A Journey Through the Subcontinent’, ‘The Hungry’ and ‘Village Rockstars’. The first two are also coming to LFF 2017.